Gary Joseph Gaetti was born on August 19, 1958 in Centralia, Illinois. He was a star athlete at Northwest Missouri State University, getting credit for hitting the longest HR in the school’s history, measuring over 505 feet. He is inducted in the NMSU’s Hall of Fame. The six foot right hand hitting Gaetti got drafted in the first round of the 1979 draft, (the 11th pick overall) by the Minnesota Twins. He showed power at the minor league level hitting 22 HRs in 1980 & then 30 at Orlando in 1981 getting called up to the Twins that September. In his first MLB at bat he hit a HR off Texas Rangers veteran; Chalie Hough. Midway through the next season, he became the Twins main third baseman. Gaetti was an outstanding defensive third baseman, winning four straight Gold Gloves from 1986 to 1989. 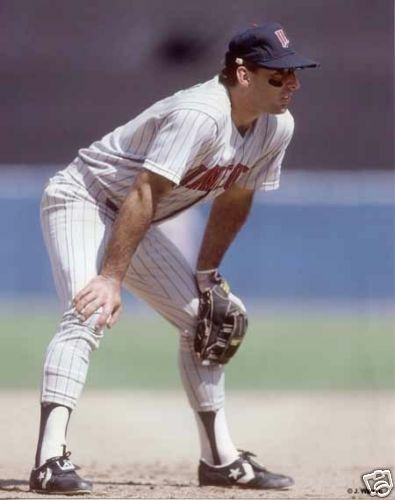 Defensively in his career Gaetti led all third baseman in assists & put outs four times each & fielding percentage three times. He has played the third most games ever at third base (2282), turned the third most double plays (460) & is sixth all time in assists (4531). His .965 career fielding percentage at third base is the 23rd best all time. He made two All Star teams with the Twins, hitting 20 or more HRs six times, including two 30 plus HR seasons. He drove in 80 plus runs five times, including two seasons with over 100 RBIs. 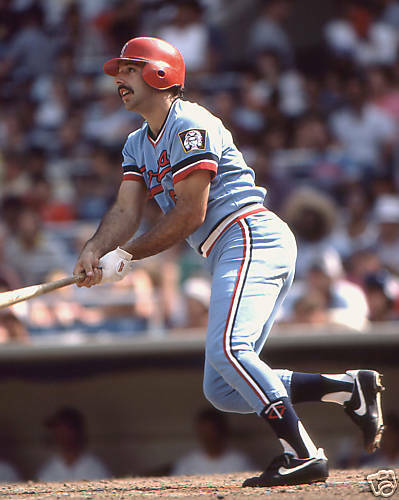 Gaetti scored 90 plus runs twice, gathering over 150 hits three times, but also had over 100 strike outs four times in his career. He had his best seasons in Minnesota in the mid eighties; in 1986 he hit 34 HRs with 108 RBIs & a.287 Ave. In the Twins 1987 Championship season, he hit 31 HRs with career highs in doubles (36) RBIs (109) & runs scored (95). Post Season: In the 1987 ALCS he became the first player ever to hit HRs in his first two postseason plate appearances. He hit two solo HRs, off Detroit's Doyle Alexander, in Game #1, leading the Twins to an 8-5 win over the Tigers. He drove in two runs in the Twins Game #3 loss & a had a sac fly RBI in Game #4 putting Minnesota ahead for good. Overall he hit .300 in the ALCS with six hits, five runs scored & five RBIs, earning him the Series MVP Award. 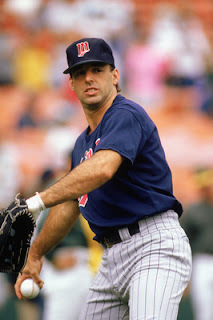 In the World Series against the St. Louis Cardinals, he had two hits in the Game #1 Twins 10-1 win. In Game #2 he had two more hits, including a solo HR off Danny Cox. In Game #5, he doubled home another run in the Twins 11-5 win. Overall he hit .259 with 7 hits, one HR two doubles & 4 RBIs, as the Twins won their first Championship. Gaetti was known as a party guy, having a good time drinking & staying out late with the ladies. This earned him the nicknames “The Rat” & “G man". But in 1988 he changed all that becoming a born again Christian. That year he hit .301 with 28 HRs & 88 RBIs. He even displayed a religious slogan on his batting gloves during the 1989 All Star Game's pre game introductions on national TV. Some say the mood in the Twins clubhouse changed drastically after his conversion & his hitting fell off as well. In 1990 he made history at Fenway park when he started two different triple plays in the same game. After the 1990 season, his average fell to just .229 although he did hit 16 HRs & drove in 85 runs. 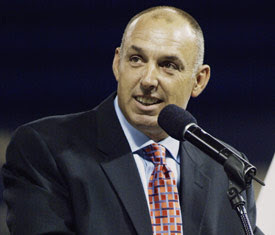 Gaetti went further west, signing a big contract with the Anaheim Angels. His numbers dropped off significantly in California, only hitting a high of 18 HRs while batting a high of .246 in 1991. He was hitting only .180 after 20 games in 1993 when the Angels released him. He signed on with the Kansas City Royals and had an injury ridden 1994 season, where he did hit .287 in 90 games. At age 36, he turned his career & became a top player once again. In 1995 he hit a career high 35 HRs with 96 RBIs and a .261 average for the second place Royals team that featured Wally Joyner. The following year he was granted free agency &signed with the St. Louis Cardinals. He hit 23 HRs while batting .274 but had his numbers fall off the next year. He made the post season again with St. Louis getting to the NLCS & losing to the Atlanta Braves in 1996. He hit two HRs with seven RBIs in that post season. He played parts of three seasons there before getting released in 1998. 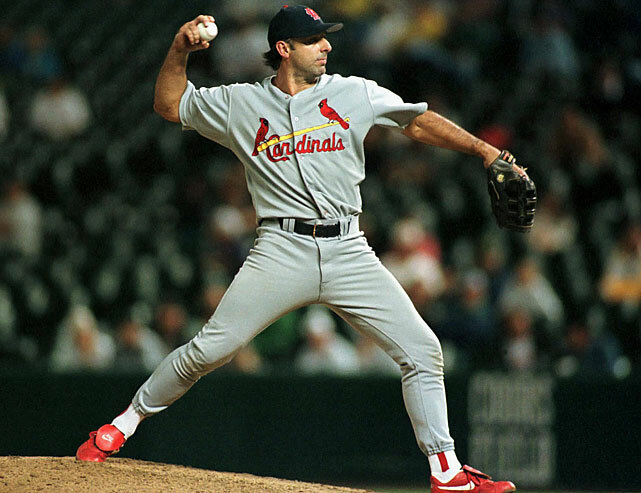 His career winded down as he moved on to the Chicago Cubs (1998-1999) getting to an NLDS in 1998 & then the Boston Red Sox (2000) before retiring at the age of 42. 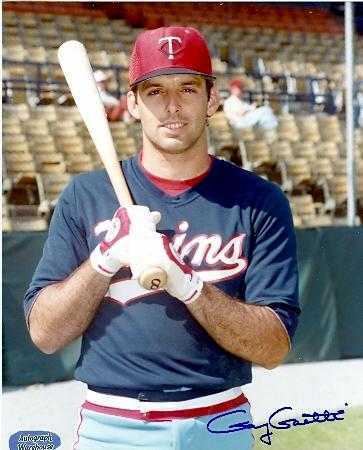 In a 20 year career, Gaetti put up some very impressive numbers; 2280 hits (152nd all time) with 360 HRs (76th all time) 1438 singles (240th all time) 443 doubles (107th all time) ) & 1341 RBIs (88th all time). He totaled 842 extra base hits (83rd all time) 104 sac flies (19th all time) with 1602 strikeouts (34th all time) in 2507 games played (53rd all time). He also grounded into 236 double plays (41st all time). On his 49th birthday, the Twins inducted him in the team’s Hall of Fame & held a bobble head night. 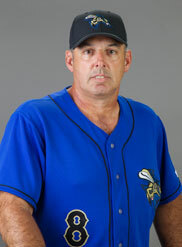 Retirement: He has coached in the Houston Astros & Tampa Rays organizations. He also works at Baseball USA in Houston.